This page describes the user interface of the iLand viewer application. This software contains the iLand "core" model embedded in an modern user interface. Be cautioned: the software is not a dedicated end user tool, but rather a research tool - so sometimes the design may be a bit quirky, or the behavior odd; however, the iLand user interface matured over the time and includes now some valueable functions that can make the life of the model user easier. (1) The toolbar provides access to the most important functions: you can create / destroy a landscape (destroying means deleting and freeing all ressources), and run the model for 1 year or multiple years. While running, you can pause or cancel (Stop button) the execution. (3) The logging area shows all the log messages from the model (if logging is not redirected to a log file). This kind of log info is especially helpful to track configuration or model errors. •	Create the model ("Create" button in the toolbar). This sets up the model landscape and initial trees. •	Run the model ("Run many" button in the toolbar). Enter the number of years you want the model to run. •	The bulk of numeric outputs of the model are stored in an output database (http://iland.boku.ac.at/Outputs). See http://iland.boku.ac.at/Software+Tools for tools helping to access the SQLite databases iLand uses to store simulation results in (it is also quite easy to read these databases into, for instance, R for further analysis). The main tab lets you load project file and shows the current legend and ruler. (1) Click the 'open' icon to select an XML project file (or use the File->Open command); the 'view' button shows the XML content. To create the model, use then the buttons in the toolbar (see above). (2) the legend depends on the selected visualization option; there are, broadly speaking, two types of legends: continuous numerical values (such as tree heights or standing volume) and unique values (such as tree species or stand Ids). For continuous variables, the value range can be edited after checking "show details"
(1) Load / reload a script file; reloading means, that the file is re-evaluated in the current context. You can conveniently edit externally and quickly reload/execute code. (2) enter commands here. This can be function calls to user-defined functions (see (1)), calls to the the iLand system libraries, or even full programs (see example). (3) executed commands are stored in the command history and can quickly be recovered. In addition, often used commands can be made accessible as links below (3). See the setUIshortcuts method of the Globals object. 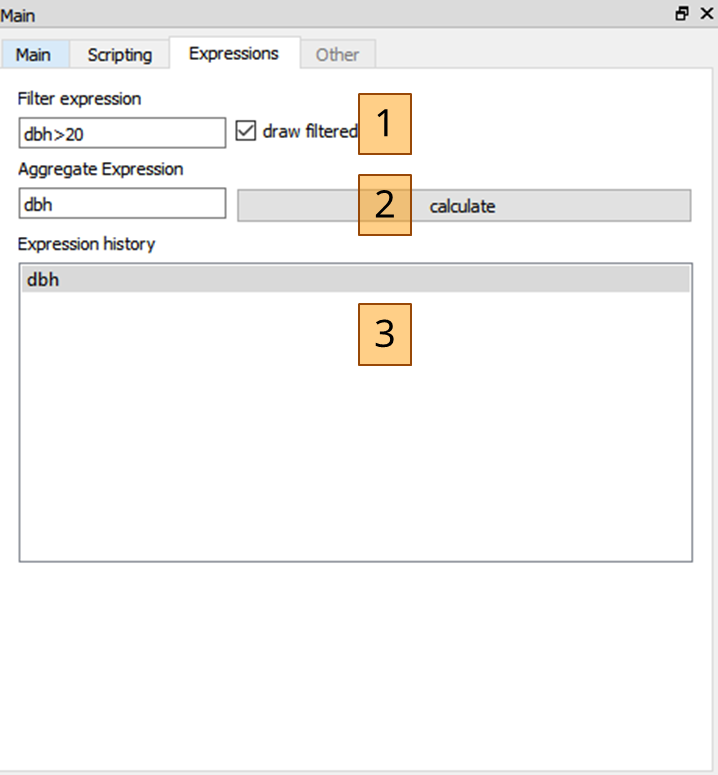 (4) script output (e.g. results of 'console.log()' calls) is printed in this area. Note, that output is also redirected to the iLand log. See iLand scripting for more on the scripting capabilities of iLand, and the Scripting page for diving into the iLand API. Note that availability of some functions depend on the enabled modules of iLand. 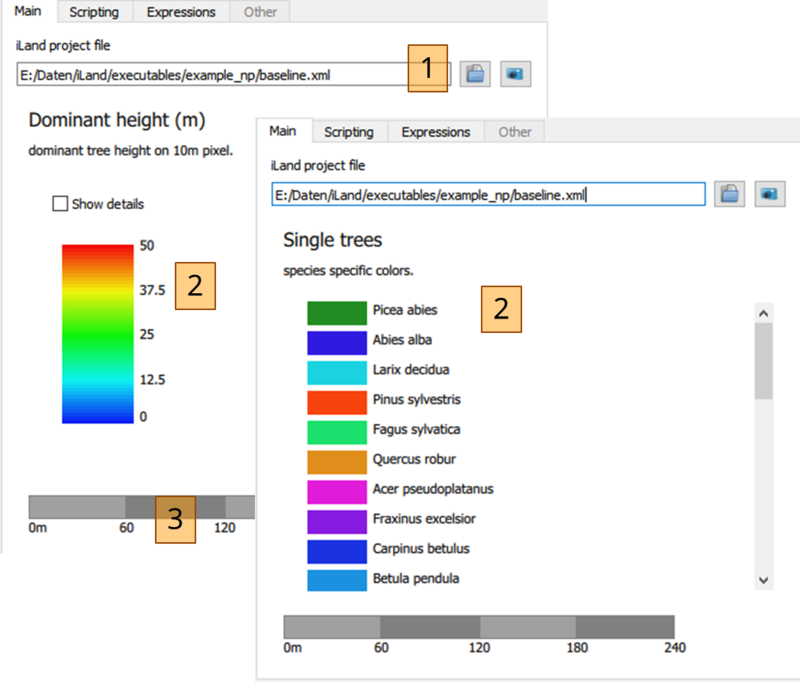 The 'expression' tab allows some basic analysis of the properties of the trees on the landscape. (1) Filter the trees that should be considered. See expression for details, and tree variables for a list of all available tree variables. Note that you can filter also by species (e.g., species=piab). Checking "draw filtered" shows graphically (after a redraw) which trees pass the filter expression. Light influence field”: This is the “LIF” (http://iland.boku.ac.at/competition+for+light). Red means low, blue high light levels. Spatial resolution is a 2m grid. “dominance grid”: this are maximum tree heights at 10m resolution; areas outside of the project area are either drawn grey (areas that are assumed to being forested) or white (for non-forested areas). "seed availability": This shows the seed availablility of a selected species (4) on the 20m seed dispersal grid. "regeneration": shows the state of the regeneration layer (2m resolution). The height of cohorts are shown for a selected species (4). If no species is selected (4), the value is the maximum height of all living cohorts on that pixel. Note, that the maps are generated on the fly and may be slow to create. If the "established" box is checked, only newly established cohorts are shown (with value=1 for pixels with new cohorts). The species filter (4) works as described above. “Individual trees” shows tree crowns from bird’s eye perspective (i.e. as stylized circles with the radius indicating the size of the tree). The color indicates their competitive status as described by the light resource index (LRI, again, red means low LRIs, see competition for light). Check 'color by species' to draw trees in species-specifc colors. The "draw transparent" option adds transparancy, which may help visualize dense multi-story forests. 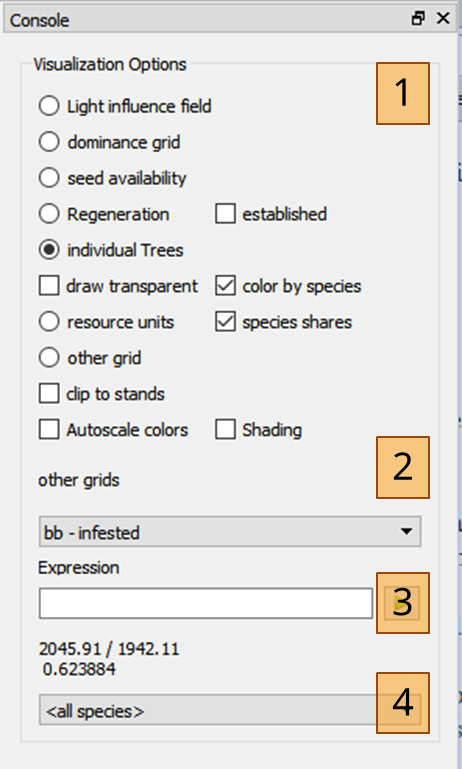 There are additional options for defining which trees to draw: use the species filter (4) or the "expressions" in the main side panel. "other grid": some modules of iLand provide additional grids that can be visualized (2). Examples are a digital elevation model, details of disturbance modules, and several layers of the agent based forest management engine. Each layer has a brief description and has a legend (i.e. color ramp and value range). Clicking on a tree and a resource unit, respectively, shows their attribute in the “Data” box in the lower right corner. You can enter mathematical expressions (expression) using these variables in the „Expression“ field to visualize various aspects (e.g. “dbh” or “dbh*dbh/4*3.141592” to calculate basal area). For trees, the scale is fixed to 0-1, so you might have to adapt your expressions (e.g. "dbh/100"). For resource units, the "Autoscale colors" options can be used to auto-scale to the value range of the current expression. The "clip to stands" option masks out grids (especially the "other" grids) with the project area (as given by the stand grid). The "autoscale" colors scales the visualization to the value range in the data. Note, that this works only for some options. The "shading" is an experimental feature, which works only when a DEM is available: it then overlays the DEM shading with the current visualization. The coordinates under the current mouse position are shown above the species filter (4). The coordinates are always in meters, and are relative to the location defined in the project file. In addition to the coordinates, the value under the mouse is shown (this works not for all types of visualization). Use the mouse wheel (while positioned over the landscape) or use the '+' or '-' keys of the keyboard. For keyboard zoom the focus must be on the landscape, i.e. a single click into the landscape might be necessary. Click with the left mouse button and drag. After releasing the mouse button the landscape is redrawn (so there is no visual indication during the drag process except the changed mouse cursor). 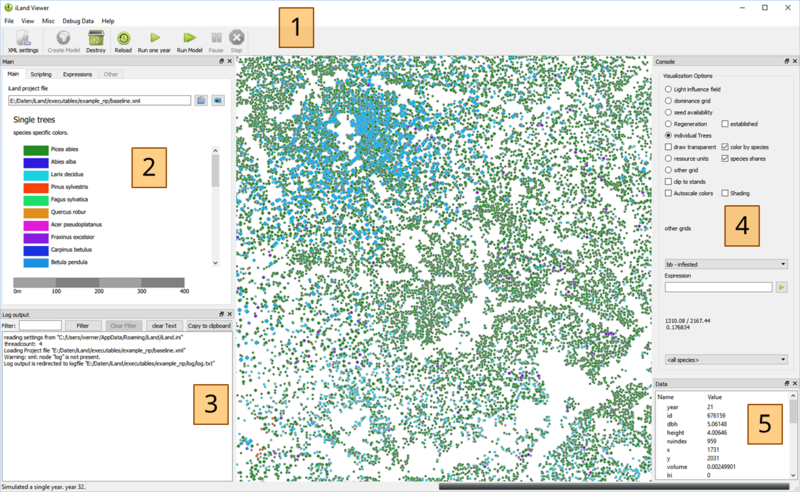 Clicking with the left mouse button inside the landscape will select a single tree and show a list of tree properties in the data view window. If the current view is "resource units", then resource unit aggregates are shown. You can copy a "screenshot" of the main visualization area to the clipboard by pressing "Ctrl-P" or by selecting "copy image to clipboard" in the "View" menu. In addition, the screenshot is saved as "screenshot.png" in the project directory. Press 'F5' to refresh the visualization area, press the 'F6' key to zoom out to the full landscape. iLand tries to reload the last loaded project file. To accomplish this, iLand saves the name of the last successfully loaded project file in a small text file named "lastxmlfile.txt" loacted in the same directory as the executable itself. On startup, iLand uses this information if present. This behavior is overruled, if a XML filename is provided as a command-line argument to the executable (e.g. iland.exe e:\iland\project\project1.xml). make screenshots to a given file, force a repainting of the screen, and wait for a given time (the screenshot(), repaint() and wait() functions, respectively). Those techniques can be used to create animations (that are put together from individual screenshots). Note that a simple log file of batch operations is maintained: every time iLand starts in batch mode, some details (e.g., project file, time, ...) are added to a file called "batchlog.txt", located in the directory of the executable file (creation of that file may fail due to permission problems). A little "About" dialog is accessible from the main menu (Help->About iLand). A piece of information here can be particularly helpful: the model version, the used compiler, the date of building the software, and the revision number in the source code repository (SVN-Revision). Created by werner. Last Modification: Thursday 01 of February, 2018 16:20:07 CET by werner.